November is time for Wring-Out !! It used to be that “R&R” used to mean rest and relaxation … but if you are a Committee Chairperson or Advancement Coordinator, then R & R stands for Recruitment and Recharter. For many units, your main recruiting efforts are complete and rechartering is “months away” — so you can take a break, right? November is Wring-out and if done right, wring-out is the single most important thing that you can do to ensure an easy recharter in a few months. Wring-out is to ensure that everyone in your Pack/Troop (Crew/Team) is registered with the BSA (and vice versa) — it’s a simple comparison between your list and BSAs. And it really is simple; just take whatever list you use — a DOC, an XLS, a Packmaster/Troopmaster export, etc. — and send it to Council via your Commissioner. They will compare it with what is on the BSA system and then follow-up with any discrepencies. Important hint — while this may be obvious, the only list/roster that you should not use is any kind of export from a BSA system (e.g. my.scouting.org) … because that is the same database that the Council will use. That being said, this is a great time to try out the new my.scouting.org tools. 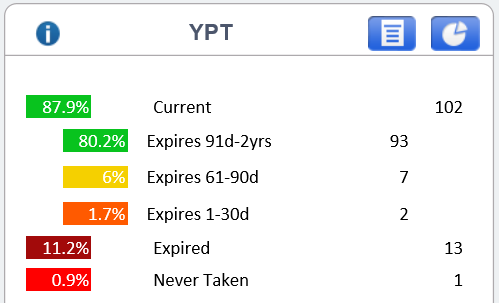 You are certainly welcome to compare the lists and do your own wring-out comparison, but more importantly — look at the YPT report. One of the best new features in the BSA My Scouting site is a YPT aging report that tells you when every adult member’s YPT will expire. This is huge because the single hardest part of recharter is chasing adults to re-certify. From the upper-left corner, pull down the list and select the “Training Manager.” Note: if you are also registered as a District or Council team member, you may have extra options, but under the banner of your unit, there is a “Training Manager” link. 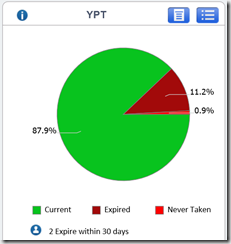 You can now generate a report of whose YPT will expire. 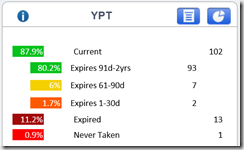 KEY POINT – Recharter will happen sooner than you think, and only thing less pleasant than chasing down volunteers’ YPT renewals during the holidays to be the volunteer being badgered to recertify. So, do them and you a big favor — pull your report and give then November to recertify before the holidays get busy. If you do the hardest part now (while it isn’t that hard), then recharter is a few signatures and cutting a check (give or take). How active is your Council in Religious Awards?